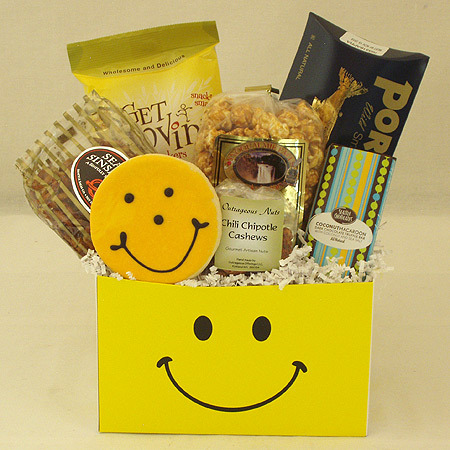 This cheery Happy Face Gift Box will put a smile on their face! A yummy combination of savory snacks and sweet treats including Portlock’s Smoked Salmon, Partner’s Crackers, Seattle Pretzels, Outrageous Offerings Chipotle Cashews, Snoqualmie Candy Co. Caramel Corn, Seattle Chocolate Truffle Bar and a Smiley Face Iced Shortbread Cookie. A great way to say thank you, job well done, get well, congratulations or turn that frown upside down!